Summary Third generation of Apple's cheapest wireless router in new form factor with two radios and WAN and LAN ports for both wired and wireless routing. Judging from the interest in the Inside Story article, it looks like there is a lot of interest in what is essentially a commodity product, i.e. a dual-band simultaneous dual-stream ("N600") wireless router with 10/100 Ethernet ports. But Apple's corporate halo apparently extends to mundane wireless products. So let's see what Apple has come up with for 99 bucks. Apple is positioning the new Express as a wireless music and printer sharer and router for "apartment, smaller home, or dorm". The chart below shows key differences between it and its more expensive siblings. 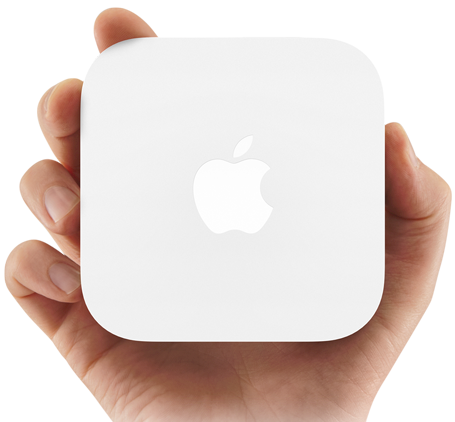 Apple has abandoned the wall-wart form factor of the previous Expresses and instead switched to the Apple TV "hockey puck" format. So that you can tell them apart, Apple made the Express white vs. the TV's black. Like the Apple TV and previous Expresses, the power supply is built in. The front has only a lone LED to indicate power and status, while the rear has the port complement shown below. The single WAN and LAN ports are 10/100, not Gigabit and the USB 2.0 port is there to share only printers, not storage. Like the original Expresses, the newbie acts as an audio AirPlay device, which will show up when you fire up iTunes or Apple's Remote app. Just plug in a set of powered speakers into the jack shown above, select the Express as an AirPlay output and you'll be good to go. If you're going to use the Express as your main router, you'll probably want to plug a switch into the LAN port to get yourself sufficiently connected. The Inside Story article has everything you'd want to know about what makes the new Express tick. I've included just one internal shot below, there are more over in the other article. If one photo is enough and you don't feel like clicking, Table 1 details the QCA-based design.